The DigiTech FreqOut Natural Feedback Creator allows you to get sweet, natural feedback at any volume, with or without distortion. The FreqOut is perfect for situations where volume must be controlled like in the studio, with in ear monitors, or low-volume performance and practice. However, the FreqOut can also be used at gig volume to focus out-of-control feedback on a preferred harmonic at any stage position. 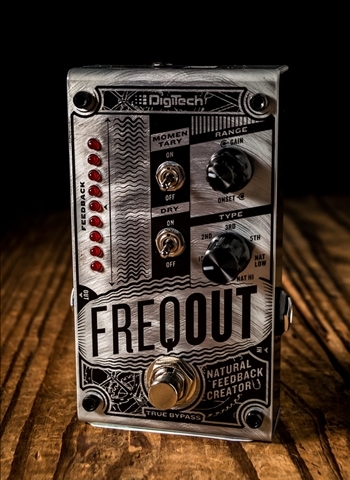 The FreqOut has adjustable feedback Onset (delay before feedback begins), Gain (feedback level to balance with your dry signal), Dry On/Off, latching or momentary operation, true bypass, and a rugged road-tough steel chassis.